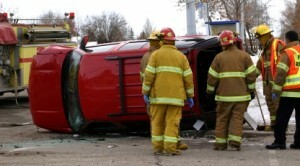 Car, SUV and truck rollovers are one of the most serious types of personal injury accidents. The physical science of a rollover accident leaves little room for drivers and passengers to walk away unhurt — cars, trucks and SUVs moving at a high rate of speed (even if they are not speeding), the weight of the cars, the hurling of the vehicle, the forceful impacts as the car or truck repeatedly hits the earth, trees or even buildings. Swerving to avoid animals or objects in the road — drivers often suddenly swerve to miss animals in the road or items that have fallen off of trucks, and then over-correct. If your or a loved one has been involved in a rollover accident, contact the Oklahoma personal injury lawyers at Carr & Carr Attorneys. You may be entitled to compensation for medical bills, future medical bills, lost wages if you were off work, and pain and suffering. Email us or call 1-877-392-4878 to speak with an attorney who can help protect your rights and determine what legal action you need to take.